Holiday Tee Collection - 5 Styles for Just $16.99! You are here: Home / Great Deals / Christmas Deals / Holiday Tee Collection – 5 Styles Just $16.99! Holiday Tee Collection – 5 Styles Just $16.99! 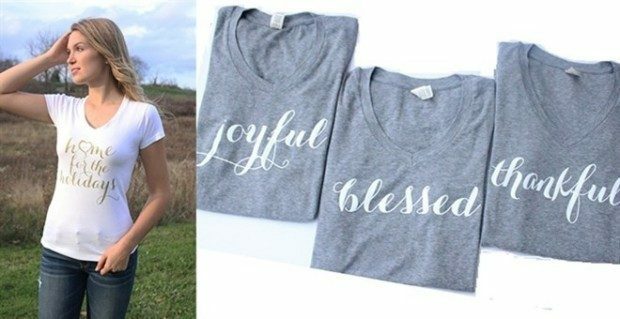 Head over to Jane and order a top from the Holiday Tee Collection – 5 Styles for Just $16.99! Choose from one of our new Holiday tees – the softest knit tee in beautiful Holiday sayings in a gorgeous handwritten font! Available in white or grey v-neck short sleeve tee – longer length! Layer over a long sleeve tee or wear under your favorite cardigan! Grey tees are printed with white lettering and White tees are printed with Gold sparkle lettering!